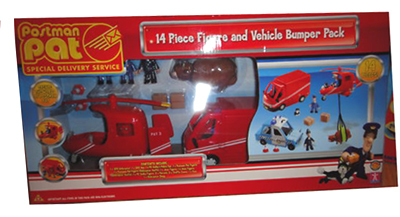 The Postman Pat SDS 14 Piece Figure and Vehicle Bumper Pack from Character Options contains the SDS Helicopter, the SDS Van and PC Selby’s Police Car. The set also contains figures of Postman Pat, Pilot Postman Pat, Jess, Jess (Helicopter Outfit), PC Selby and Daisy the Cow. Two Parcels, two Traffic Cones, and a Helicopter Sling are also included. This set was released in 2010.